There was mixed news for Labour across Berkshire as they were hammered in Slough, losing control of the council. They lost 11 of their 26 seats - leaving the council under no overall control. They remain the biggest party. But Labour councillors in Reading breathed a sigh of relief after it was confirmed they escaped the poor showing of the party elsewhere in the country. The party remains firmly in control with 35 seats, ahead of the Tories on six and the Liberal Democrats' five. In Slough Labour lost 11 seats taking them to 15 while the Lib Dems picked up five seats, the Tories three and three seats went to independent parties. 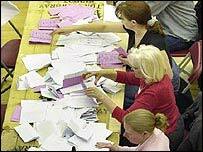 One seat, Wrexham Lea, was a dead heat and had to be decided by drawing lots. In Reading, the Tories took one extra seat available after a boundary change, and took another from the Lib Dems. The earlier de-selection of Labour's Reading East MP, Jane Griffiths, seemed to have had little effect on voters. Labour MP Martin Salter said of the opposition's failure to take any seats from the party: "They laid out no manifesto, no vision for Reading. "Labour was the only party offering something to positively vote for." Meanwhile, in Wokingham Labour lost its only councillor while the Tories kept hold of power, gaining six seats. They now hold 39 of the 54 seats with the Lib Dems holding 15.